If you live in St. Louis and you have not visited The Magic House, You may be living under a rock. If you are visiting St. Louis and have kids, I consider it a must stop. It is seriously one of the most wonderful places to learn and experience all the magic of science and exploration with your kids! I get excited every time I walk in the door. The exhibits are always growing and changing, and all of us are ALWAYS LEARNING. I was honored to host a Fairy Tale Party at the Magic House recently with The Crumbly Crew in their private party room to show off their wonderful birthday program. The Magic House offers 5 themed birthday parties for ages 3-8. They include Art Celebration, Construction Zone, Fairy Tale, Planes Trains & Automobiles, and Science Magic! I have to say, the next party I host will definitely be a science magic party! That one looks AWESOME! But seeing as its almost Halloween, and both of my babies love to dress up, I went with the Fairy Tail Themed Party and invited some of their best buds to dress up and party with us. Something that really stood out to me was how wonderful it was to have an incredibly sweet party staff. Gabby, Brian, and Sophia instantly started unpacking all my snacks and toys and interacted with my kids, getting them excited for the guests to arrive. I've thrown A LOT of parties but this crew really took the pressure off of me so I could just enjoy. Can I get an WITNESS from all the stressed out party moms? The little Prince and Princesses arrived and shortly were whisked away to start their first craft, a DIY Crown . The kids got to decorate with shapes, colors, feathers, and stones. They put them on and headed to the next craft, making Fairy Wands. Juliette continues to wave it at me every night before bed. She keeps it right by her bed, it was her favorite party prize! After Crafts was snack time which The Party Crew graciously served to our little friends. The kids got to decorate their extra special dessert cupcakes provided by the magic house which serves as a birthday cake so no worries about ordering a super expensive one! That is AMAZING. I love the flexibility that the Magic House party program offered . You can bring in your own food and drink, order pizzas, or just do some fun snacks like we did. Each party comes with a drink and cupcake with decorating supplies for each kid. I do like to cook with my kids but I like for them to decorate cupcakes outside of my house.... Sprinkles galore! The sweet party crew cleans up the whole mess. Special Shoutout to one of my favorite local companies Nourish By Holly Berry who sponored her famous Honey Goat Cheese and Artichoke Dip for our party, it made all the parents SO happy. 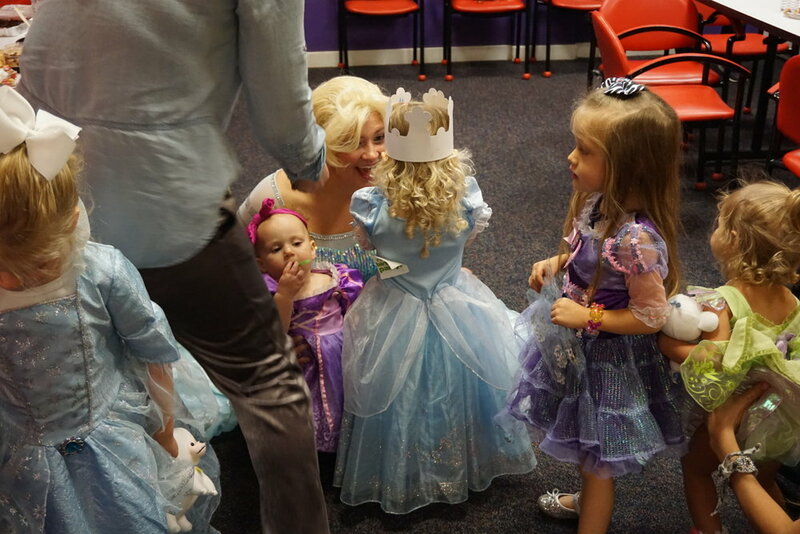 Thanks to KidzXplor St. Louis, an amazing company that connects parents with the best of the best classes and activities for their kids, we got to extend a royal invite to a special Princess to attend our Party. Elsa the ice queen came from Once Upon Occasion Events, She isn't included in the party but it was so wonderful of the Magic House to allow us to make the party custom with that extra special appearance. The kids got to dance and sing with her before it ended. When the festivities are over, the party doesn't have to end. You can stay with your friends and family for hours on end because with your booking each child invited gets a free pass to the Magic House ALL DAY! This is a crazy awesome deal and really takes even more pressure off of the host for entertaining. After their sugar rush and crafting craze, the ones that didn't head home for naps got to go upstairs and explore the newest Dinosaur Train exhibit. I swear my kids ask to go to this place EVERYDAY. Im so grateful to The Magic House for including us in their Party Program and letting us go wild on our costume obsession! I cant wait for their Not So Scary Halloween Party Friday October 20-22, and the 27th -29th. They talked about it on Fox News this Morning and the #Crumblycrew was back with new costumes OBVIOUSLY. Thank you to The The Magic House and all their amazing sponsors for providing such a glorious place for our kids to learn, I don't take it for granted! In Fact I'm a MAGIC HOUSE MEMBER, which is the best deal in town.